According to The American Journal of Preventive Medicine, Media campaigns that portray the tobacco industry in a negative light may be a powerful intervention to decrease young adult smoking, U.S. researchers said. To determine attitudes, the researchers at the University of California, San Francisco, asked respondents how strongly they agreed or disagreed with three statements: Taking a stand against smoking is important to me; I want to be involved with efforts to get rid of cigarette smoking; and I would like to see cigarette companies go out of business. The study, published in the American Journal of Preventive Medicine, found people who agreed with those statements and supported action against the tobacco industry were one-third as likely to be smokers as those who did not support action against the tobacco industry. Among current smokers, those who had a negative attitude toward the tobacco industry were at least four times more likely to plan to quit smoking than smokers who did not support action against the tobacco industry. With people still insisting to smoke, even with some states threatening to raise the cost of cigarettes to, in some cases, $9 a pack, stop smoking PSA’s are a good way to remind people tha they should not smoke. With each video there is a slightly different message, but in all of them there is a consistent theme, and it is this: Smoking kills, and you need to quit smoking. Face it, if you smoke, you’re heading down the wrong path, and the only time it’s too late to quit, is when it’s too late. Larry Jukes said he remembers when he could buy 10 cigarette packs for $2.50. Coloradan Larry Jukes says he’s upset about the hike but doesn’t expect it will persuade him to quit smoking. But he’d now take the days when — just last month — he could buy his carton of choice for $49. Thanks in part to the largest-ever federal cigarette tax increase — a nearly 62-cents-a-pack hike that starts Wednesday but was reflected in many prices earlier — Jukes on Tuesday paid more than $58 for a 10-pack carton at the Cigarette Store in Denver, Colorado. That same store was selling it about $9 cheaper weeks ago. Jukes and other shoppers there said they feel stuck and taken advantage of. The cigarette excise tax that tobacco companies must pay the federal government rose Wednesday by 61.6 cents per pack, or $6.16 per carton. The tax now comes to about $10.10 per carton, or $1.01 per pack. But major tobacco companies began incorporating that increase into their prices to wholesalers in March. And the companies, wholesalers and retailers in many cases gave prices a boost beyond the tax increase, in part to make up for an expected drop in sales caused by the hike, some of them said. “I think it’s ridiculous. … They’re picking on smokers,” Egger said at the Denver store, where she bought two cartons Tuesday. “I think they’re trying to run the tobacco companies out of business. 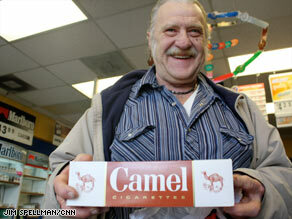 Federal taxes also are going up Wednesday on other tobacco products, including cigars. Federal per-cigar taxes, which vary based on weight and price, used to be capped at 4.9 cents but now are capped at 40.26 cents. The tobacco tax hikes, which President Obama signed into law in February, will be used to finance an expansion of the State Children’s Health Insurance Program, or SCHIP. The expansion, which will cost $35 million over five years, is expected to secure federally funded health care for an additional 4 million children. Before the expansion, SCHIP covered almost 7 million children whose parents earn too much to qualify for Medicaid — the federal health insurance program for the poor — but can’t afford private insurance. Dave Bowersox, who bought a box of Prime Time Little Cigars at the Denver store Tuesday, said he’s fine with the tobacco tax increases. “I think tobacco, alcohol, that kind of stuff should be taxed instead of gasoline and food — things that are necessary for people to survive,” Bowersox said. Cigarettes, too, have been hit by state excise tax increases. Since January 2002, the average state cigarette tax has increased from 43 cents per pack to $1.21 per pack, according to the Campaign for Tobacco-Free Kids. A conservative estimate for the average per-pack cigarette price in the U.S., based on data collected from states and territories at the end of 2008 and adjusted for the federal tax increase, is $4.80, the group’s Eric Lindblom said. Tobacco company Philip Morris USA raised list prices for its major brands by about 71 cents per pack last month “in direct response to the tax increase,” said Bill Phelps, spokesman for Philip Morris’ parent company, Altria. RJ Reynolds Tobacco Co. on March 16 raised its cigarettes’ list prices by 41 to 44 cents per pack and, in many cases, reduced discounts to retailers, basically keeping “our pricing in line with the competition,” spokesman David Howard said. “The federal tax increase was the primary driver,” Howard said. Both companies said they expect a decrease in sales, with Howard noting industry analysts have estimated a drop of 6 percent to 8 percent. One factor in Philip Morris’ decision to increase list prices beyond the tax hike was the company’s expectation that the new tax level will decrease sales, Phelps said. Not all U.S. sales declines would be due to smokers quitting, Phelps said. “Tax increases create an incentive for people to bring cigarettes into the country illegally — [from places] where they don’t have to pay that higher tax,” Phelps said. Nick Hamad, a tobacco store owner in Seattle, Washington, said he thinks the tax will ruin the American tobacco industry. As for Jukes, higher prices probably won’t force him to quit smoking, he said. “I’ve been smoking about 50 years,” Jukes said. What happens every time you smoke. If this isn’t as good a reminder as to why you need to quit, we’re not sure what would be. Even 50 years ago addiction wasn’t pretty or funny even for Goofy.